Synopsis:"The Kevinian cult has taken everything from seventeen-year-old Minnow: twelve years of her life, her family, her ability to trust. And when she rebelled, they took away her hands, too. Now their Prophet has been murdered and their camp set aflame, and it's clear that Minnow knows something—but she's not talking. As she languishes in juvenile detention, she struggles to un-learn everything she has been taught to believe, adjusting to a life behind bars and recounting the events that led up to her incarceration. But when an FBI detective approaches her about making a deal, Minnow sees she can have the freedom she always dreamed of—if she’s willing to part with the terrible secrets of her past. 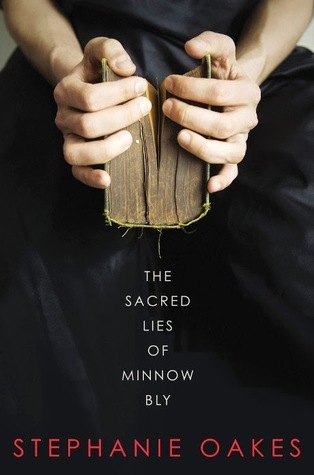 The Sacred Lies of Minnow Bly is a hard-hitting and hopeful story about the dangers of blind faith—and the power of having faith in oneself." The moment I picked this book up from the library, I was curious; curious about the cover, about the plot, about everything. Let me tell you, Stephanie Oakes keeps you curious until the very last page of the novel. This is the type of book where I'd think, if it were to become a movie, the critics would fall in love with and the audience would think it ok. The reason for this is the character development was superb of course, and that Oakes creates the story different than a normal author would; she tells the story in pieces. This way, I was not frustrated for not getting the answers to my questions, but instead I was satisfied bit by bit until I understood the whole story. The reason that the audience of the "movie" would believe it to be ok is the fact that The Sacred Lies of Minnow Bly is more of a "Mind over Matter" type of novel. There is action and some suspense, but not much considering the reader already knows where Minnow ends up before she even begins her story. However, the real beauty in the novel is reading into Minnow's mind and figuring out how she copes with her story in juvie (with the help of Dr. Wilson). "'I think about those moths. They would fall down dead on the stands, and I'd pick them up and stare at their white bodies, their feathered antennas, their strange soft wings, and wish they'd thought a little bit before that. Before they gave it all up for a lie.'... His voice winds down from high above: 'So how do you avoid becoming a moth?' 'You tell me,' I say. 'No.' I look up. His face is shadowed against the light. 'What?' 'That's how you avoid becoming a moth,' he says. 'Stop asking others what to believe. Figure it out for yourself.'" (276). Holly has read 2 books toward her goal of 40 books.